My least favorite move of the Hot Stove season last winter was the Atlanta Braves trade of Javier Vazquez to the New York Yankees. First off, I just didn’t like the return the Braves got for Vazquez who was coming off of a brilliant season, the best of his career. Upon further review, Arodys Vizcaino is a much more heralded prospect than I originally realized so that helped the deal. He is just 19 though, so he’s far from a sure thing. And judging the trade as a whole now after the 2010 season and into the 2011 Hot Stove really shifts the advantage to the Braves. Not only was Vazquez a total flop in New York (5.32 ERA, 1.40 WHIP, nearly -3.0 K and 2.0+ BB difference in his per 9 IP rates), but the Braves were able to flip Michael Dunn, another part of the package from New York, to the Florida Marlins for Dan Uggla. At the time though, I mostly disliked deal from a selfish fantasy baseball angle. I bought in heavily on Vazquez in the spring of 2009 and reaped significant benefits from his Cy Young-quality season and planned to do the same in 2010 as a well-priced keeper in NL-Only leagues only to have that plan dashed with the trade. Granted, no one cares about my fantasy fortunes one way or another, but Vazquez shifting back to the American League was a loss globally as his best work had always come in National League. Over the weekend, Vazquez and the Florida Marlins agreed on a 1-year deal worth $7 million with both a full no-trade clause and a clause stating that the Marlins can’t offer him arbitration next winter. The former isn’t terribly worrisome as I’m sure Vazquez would waive it to go to a contender (non-New York division) if the Marlins were languishing through a terrible season and looking to move him. The latter is definitely a significant concession for the Marlins, but in return they no doubt got to drop the price on the contract. It would have been nice to have the compensation pick potential, but I don’t think it should have been a deal breaker so I applaud the Marlins for making sure they got a discount in return for the arbitration concession. Early reports had teams offering Vazquez a 2-year pact worth about $20 million, but Vazquez refused to look at anything more than a year so the Marlins landed a $3 million dollar discount for the two clauses Vazquez wanted. It’s hard to pin a value on Vazquez for 2011 and that could result in his being severely discounted as he was heading into 2009. The struggles he had in New York last year weren’t necessarily unexpected as many predicted a substantial drop in value, but the level to which he struggled was a surprise. He has always been home run prone and that was only exacerbated in Yankee Stadium with a career-worst 1.8 HR/9. His home run rate climbed from the previous year during his first stint with New York so I’m not sure what the Yankees were expecting with an even more homer-friendly home park. 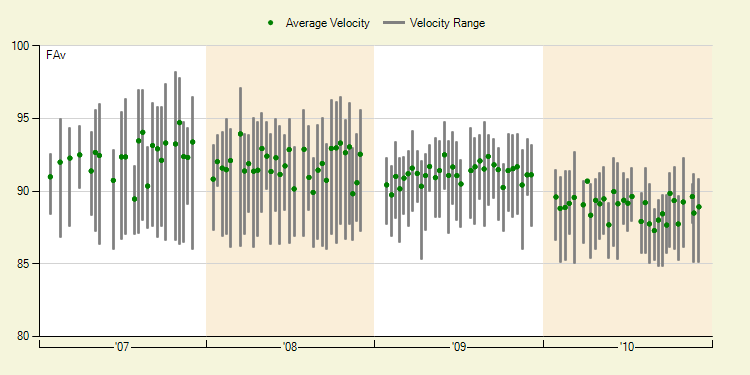 The most alarming factor from his 2010 meltdown was the drop in velocity. This has become a hot topic since rumors of his signing began swirling including a deeper look at it from FanGraphs.com writer Dave Cameron. Cameron isn’t hopeful that he can regain the lost speed and without it, he isn’t sure Vazquez can be of much value. Given his career workload, I wouldn’t bet on Vazquez’s fastball ever coming back. And if it doesn’t, well, the Marlins just risked $7 million in the hopes that he can teach himself how to pitch without his main weapon. That’s a pretty substantial risk for a team that isn’t exactly rolling in money. A drop in fastball velocity is never a good thing, so I won’t try to make that case, but I’m not sure that it is a complete doomsday scenario if his velocity plateaus at the new level. He still has a plus changeup and a plus curveball to fall back on. Instead of relying more on fastball generated swings & misses, he will need to become a better “pitcher”, more crafty if you will. His flyball tendencies (41% career rate, 0.96 career GB/FB rate) won’t hurt him nearly as much in Sun Life Stadium as they did in Yankee Stadium and his strikeout and walk rates are more likely to move back toward his career rates than they are to stay where they were in 2010 just by virtue of the fact that he is back in the National League. I wouldn’t make too many judgments based solely on his disastrous 2010 when he is also a year removed from a season that earned him Cy Young consideration. Plus he has a bit of a Bret Saberhagen thing going with every other year ERA spikes and drops and though I’d be reticent to bet on a theory like that, he has done it every year since 2000. I’m definitely willing to invest in his 13-season track record as opposed to shying away based on his worst year since his rookie year of 1998. If a sub .500 record and 4.67 ERA in 2008 held his value down going into 2009 despite strong supporting skills, then I can’t imagine having to pay much to take a chance heading into 2011 after the bottom fell out on his numbers in 2010. Vazquez will be on my radar for 2011 and he won’t need to post a 2009 line to return a profit.